Brush Today for Nigeria Has made WORLD RECORD!!! I guess Nigeria will by all means not be left out of the hall of fame, the Largest, fastest, most daring people on earth also the most toothbrushed people on earth. 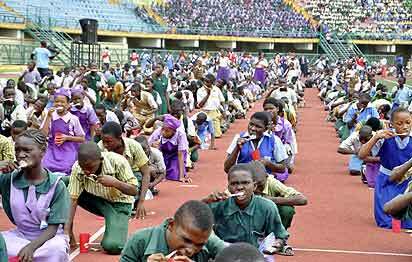 Nigeria, earlier on Thursday, set a new world record for toothbrushing. 300,000 pupils representing more than 600 public schools in Lagos have made history by simultaneously brushing their teeth for 60 seconds across different locations in the state. India held the previous record; achieving the feat with 177,003 pupils in 2007. The new Guiness Book of Records entry began at exactly 2:15pm earlier today after Dr. Lawal Bakare, the founder of HEIT Solutions, and the convener of the Tooth Brushing Challenge Project, had certified that each of the participants has a tooth brush and toothpaste provided by Unilever Nigeria Limited, one of the event sponsors at the Teslim Balogun Stadium, Surulere. Today is Friday in my home country Nigeria and this blog is dedicated to everything that is fun and entertainment but within reasonable limits,stay tuned. The Right to SUE JONATHAN GOODLUCK!!! 3 Top Strategies that Sell Content Writing Gigs on Fiverr.